Any language is the soul of its people. The Chinese language represents the soul of China. This book about calligraphy, the most revered of the arts in China, is a key to the Chinese soul. This original work is the first to explore for young readers one of the oldest and most difficult writing systems in use in the world. In narrative and photographs, it shows how Chinese artists, through the medium of the brush, have captured in their writing the beauty and energy of nature. It explains Chinese characters, what they are, how they work and how to look at them. It introduces calligraphy, the art of beautiful writing, with illustrations of the various styles. It not only gives an understanding of the art of the brush, but is a how-to guide for the budding calligrapher. The easy-to-follow instructions tell what materials are needed, how to hold the brush, what is the correct stroke order. It also gives the nine-fold square as a practice aid. Aside from its visual appeal, this introduction to Chinese writing is a fascinating experience of the most highly prized of all the arts of China. I was very young when I wrote this book, just out of school. The great modern Chinese painting master C. C. Wang allowed me and three photographers to take pictures of his collection. There is now a gallery with C. C.'s name on it in the Metropolitan Museum of Art's Chinese collection. I was very honored then and remain so until this day. I had not seen calligraphy of C. C.'s published, except that which appeared on his paintings of mountains, the genre for which he was famous. 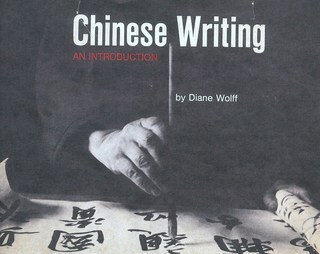 He also did the calligraphy for the cover of my first book, a guide to the Chinese language. Please accept my gift of a Free Download. This is by popular demand. The book is out of print. The rights have reverted to me. Friends have been asking me where to get this book for years. Don't forget to contact me at @wuwolff on Twitter and let me know how you like it. Chinese is now one of the most highly studied languages in American high schools. For all the mothers who have asked where their kids can get a copy of this when they study Chinese language in school, please consider this download a classic. It is a vintage piece. Chinese-American students have contacted me and said that the book helped them to understand the language of their forebears. Only in America. The field of Chinese language study has exploded in the electronic age. There are many new tools available as never before. This includes fantastic software for computer assisted language learning. But my book remains a classic. Download a copy and use it on your phone or your tablet or your laptop, or even your desktop. Some of the strokes that form Chinese characters, a twist of the wrist, the emotion of the dance, the energy of qi, of the life force itself. The structure of traditional Chinese characters. The blocks tell you how to look at this writing to make visual sense of it.